Mexico's President Felipe Calderon today challenged a joint session of Congress on gun control, asking that they reinstate a ban on assault weapons, which expired in 2004, saying 80 percent of the traceable weapons used in those crimes in Mexico, right across the border, come from the U.S. Without questioning his statistical claim, Sawyer then observed “Democrats gave him a standing ovation” while “Republicans sat silently,” a disparity which illustrated how Calderon's polemics, which ABC decided to highlight, matches a quest of liberal Democrats. 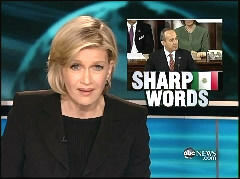 DIANE SAWYER: And Mexico's President Felipe Calderon today challenged a joint session of Congress on gun control, asking that they reinstate a ban on assault weapons, which expired in 2004, saying 80 percent of the traceable weapons used in those crimes in Mexico, right across the border, come from the U.S.
CALDERON: I admire the American Constitution, but many of these guns are not going to honest American hands. Instead, thousands are ending up in the hands of criminals. SAWYER: Democrats gave him a standing ovation. Republicans sat silently.